Guantanamo Bay detention camp is a United States military prison, also referred to as Gitmo, in Guantanamo Bay Cuba. Since the inmates have been detained indefinitely without trial and several inmates were allegedly severely tortured, the operations of this prison camp are considered to be highly controversial. Two years ago you were taken into custody by the United States military, and wrongfully accused of affiliation with several terrorist organizations across the globe. You have been plotting your exoneration and release since your arrival. Recently, several detainees have been vanishing from their cells and no one knows where they have been taken – but they don’t ever return. You sense your time is near, and now is your opportunity to prove your innocence. Just as all other detainees, you are being held indefinitely without trial, but you have made a few friends along the way who are willing to help you find freedom. 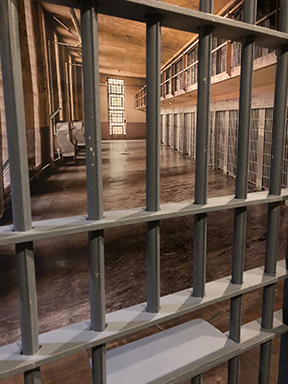 Do you have what it takes to find your way out of your cell, navigate to the prison control room and access the information you need to escape? There are no second chances!! I’ve been attending escape rooms ever since they started to really gain popularity and began popping up in different locations. I’ve been to multiple different escape rooms for events such as bachelor parties, work place retreats, and simple nights out with friends. I have to say though, the Guantanamo Bay (Gitmo) escape room at the Locked Up Fort Wayne location has to be my new all time favorite. The escape room itself was easily the best designed escape room that I have been in. The experience was fun, and challenging, all at the same time. This is something that I’ve noticed some Escape Rooms fail to achieve, but that is definitely not the case at this location. The location itself had a great atmosphere and the staff was extremely friendly. I would reccomend this Escape Room to anyone. Whether it’s your first escape room experience or your 100th, this escape room is a MUST attend. I look forward to coming back with another group of friends later this summer. 5/5 Stars. This was my second escape room experience, and this one was just as challenging -if not more- as the last. Another great immersive experience too,if not more so. Without spoiling too much, this one requires great communication with your teammates. I will admit that this caused great frustration among us, but looking back, I think the challenge makes me want to retry it. I recommend this to those looking for a challenge who have experience with escape rooms or those who operate as a team regularly.